What Type Of Referral Program Software Does Your B2B Company Really Need? There’s a lot of referral program software out there. While some technologies focus on simpler tasks (like tracking and capturing referrals), others have more complex features (like automated rewards and integrations with other tools) to create a more seamless experience. To help you sort through the endless number of options, we’ve created this flowchart so you can determine the kind of referral software program your company is ready to commit to. In this free eBook, you’ll learn the referral technology features you should be looking for to consistently generate high-quality referral leads from your customer base. Start building your dream referral program! This lack of a strategy/technology relies on manually capturing and tracking referrals. There is no clear process for requesting referrals, closing the feedback loop or rewarding customers. Collecting high-quality referrals is also difficult due to a lack of transparency and customer nurturing before and after the referral request is made. A simple web form allows for easy customer referral submission and internal tracking. The referral data collected from the form is often transferred to a Customer Relationship Management (CRM) platform so it is accessible to sales/marketing. Reward fulfillment is likely a manual process. This lack of scalable engagement before and after customers are sent to the referral submission page may cause low-quality submissions. A fully-automated landing page and rewards system (that integrates with your CRM) allows for efficient referral collection and tracking, automated customer updates (usually via email) on the status of their referrals and standardized reward fulfillment. While the internal referral management process is effective, this system lacks a way to personally engage customers at every stage of the referral process—making it tough to consistently receive high-quality referrals. The referral nurturing, submission, feedback and rewards processes are fully-automated and integrated with an advocate marketing program. A points-based rewards system allows advocates to choose personalized rewards. This increased engagement throughout the entire referral process results in a continuous stream of new referrals. 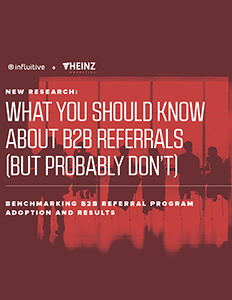 Based on a survey of more than 600 B2B professionals from across North America—including sales, marketing, operations and executive leadership—this research uncovers some striking findings about the impact of referral leads on sales pipeline and revenue growth. One Response to What Type Of Referral Program Software Does Your B2B Company Really Need?